Sevilla v Fenerbahçe–The Recap?? Sort of. I don’t know about everyone else out there, but I’m not just a fan of the beautiful game, I play it. 5 nights a week in fact. I remember last season in the Tehel Cup in Buffalo (the oldest Amateur soccer tournament in the country) and we were up 2-0 going into the second half of our game. The feeling I had going into that second half was the same feeling I had in the second half of this Sevilla game. I remember stepping out onto the pitch, trying not to win, but NOT to lose. We ended up drawing 2-2 after extra time, and losing in penalties 3-2 to be outsted from the tournament. The same thing tonight happened to Sevilla. A terrible first half from both sides, in reality, saw Sevilla with a 3-1 advantage thanks to 2 gifts from Volkan, the Fener keeper. Lack of defending lead to the first Fener goal, and to a 3rd Sevilla goal before the half ended. That 3rd goal from Kanouté essentially ended Sevilla’s thoughts about scoring, and they did not see another quality chance the rest of the game. The second half was where it all went wrong. Sevilla came out and didn’t want to put the nail in the coffin. The game got very chippy and closed in, a far cry from the previous free flowing football in the first half. They then decided to go out and ‘not lose.’ This involves not attempting to play any type of attacking football and be content to clock watch until the whistle sounds at 90 minutes. The entire second half had a strange feeling attached to it, as if I was just waiting for the Fener goal to go in. The One-liner Guide to La Liga is back like a Rolling Stones reunion tour. Let’s go. Each town in Spain has their own feria. Feria is basically, a carnival. But they are the most intense week long carnivals you will ever be a part of in your life. 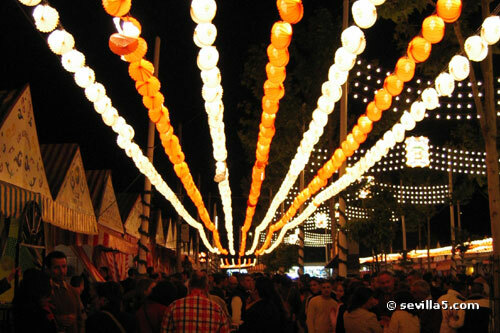 Spain’s most famous feria is ultimately the Feria de Sevilla, which is always held in April. The Feria de Sevilla was started in 1847 as a cattle trading fair, but quickly escalated into the party that it is today. This is one of the most traditional ones where women still dress in the typical flamenco dress. The ferias are also well known for having casetas which are the typical ‘little houses’ along the streets were people go and dance and eat. A Sevilla side with no excuses couldn’t defend worth a damn and still almost came out of Turkey with a win. Three Fenerbahçe goals scored on TERRIBLE defending by Sevilla. I’ll spare a recap of the game since everyone knows how much I hate doing them. But I’ll still give my two cents. Sevilla take on Fenerbahçe Wednesday in a stadium that is reminiscent of the Winter Classic played between the Buffalo Sabres and the Pittsburgh Penguins on New Years Day. The current ‘blanket of snow’ aptly named by AS.com is in the process of being cleared. Sevilla left the homeland for Istanbul with 20 players in tow. Palop, De Sanctis, Daniel Alves, Mosquera, Drago, Crespo, Fazio, Escudé, Adriano, Renato, Poulsen, Maresca, Keita, Jesús Navas, Tom De Mul, Duda, Diego Capel, Koné, Luis Fabiano Kanouté. Today, Sevilla were allowed to practice in the stadium for around 70 minutes. The players described the pitch as ‘not frozen’ but said it was ‘irregular’ (aka It was a mess). Half of the stadium was available to Sevilla, and the other half was busy being cleared off for the match tomorrow. On to the match itself. Sevilla head into this game unbeaten in their last 4 games (3-1 with the draw coming to Barcelona). Many of the pundits are talking about Sevilla finally <em>finding their form</em> and in fact, Sevilla find themselves sitting in 6th place, which gains them a UEFA Cup spot. But this game isn’t about <em>La Liga</em> it’s about the Champions League. I remember watching Liverpool play Beskitas in Turkey during the group stages. I’ve never seen a group of fans as crazy as the Beskitas fans were during that game. For 90 straight minutes the fans never stopped chanting, nor needed any part of their seat as they were standing all game long. After starting physical therapy at the University at Buffalo Sports Medicine center, I met one of the graduate students, who is Turkish and just so happens to be a Fenerbahçe fan. The last 2 weeks have been nothing but cheap shots at one another, but I’ve also learned something about this Turkish team that I can safely say I knew NOTHING about before meeting him. He says ‘We love Brazilians’. <em>Marca</em> has an article today entitled ‘Fenerbahçe dances samba’ (in reference to all of the Brazilians on the team. The most notable Brazilian on Fenerbahçe is Roberto Carlos, but they are rather stacked with Brazilians, with <strong>Zico</strong> is in his second year at the club as trainer while <strong>Aurelio</strong> speaks Turkish and is a naturalized Turkish citizen. On to Sevilla. As mentioned earlier, we are on a 4 game unbeaten streak and want to continue that run through Turkey on Wednesday night. It would be stupid of me not to say the snow could play a bit of a role in the outcome of the game, but fortunately for the game of soccer in general, it is not meant to be played in the snow. Both teams will be struggling if the white stuff starts coming down. Sevilla have no real injuries to talk about, except that <em>el capitan</em> Javi Navarro is still out and I still have no clue when he’ll be back. Chevantón is also out injured for a month, but will not really be of any necessity with both Luis Fabiano and Kanouté ready for the challenge. Hopefully Sevilla can keep the scoring boots on and find the back of the net while on the away leg. Away goals are always a premium in these home-at-home series. Some talk has been made of Diego Capel’s diving ability. As I posted on here a few weeks ago, Capel draws a yellow card every 69 minutes he is on the pitch and has 22 yellow cards against him in the first half of La Liga. That’s an insane amount of cards. He isn’t a diver. In the games I’ve caught this season, I have only seen him dive once or twice, not any more than your normal professional footballer. That’s all I’ve got as I have a soccer game myself to catch. Let me know your thoughts about Sevilla in the comments! A few people have asked me about my interview on Sevilla FC radio. I uploaded it and put it into a video, since that is really the only way to do it. The interview was about 30 minutes long, complete with me getting cut off twice due to the snow. The interview is in Spanish, but give it a listen. It really was an honor to interview with Jesus on his show and hopefully I’ll be invited back again. The Asociación Sevillista Puerta de America (aka Sevilla FC Peña (or Penya)) is now up and running. If ANYONE is interested, please shoot me an email at rjknapp19 at gmail [dot] com and I’ll email you back info and attach you to the mailing list. Here is what’s new with us so far. We’ve been approved for not-for-profit status meaning that we can be recognized now in the United States and have all of our ducks in a row so to say. We are now collecting yearly dues, which are only $25 for the year. This will allow us to get the website up and running (which I am currently designing at the moment) and also allow us to pay our dues so we can be a fully recognized ‘penya’. The higher-ups at Sevilla FC are excited that we have formed a penya in the US and we are attempting to set up a videoconference with Jose Maria del Nido (president of Sevilla FC) to recognize our official opening and founding of the penya. The Penya will be centered in NYC, but will have members throughout the US (e.g. Me, since I live in Buffalo NY, but we have a few strong members here so we will try to do our best in the B-lo). On a personal note for me. I’m being interviewed by Jesus Alvaredo, who runs a show on Sevilla FC radio called ‘Sevillistas por el mundo’ (Sevilla fans throughout the world) which follows all sorts of Sevilla fans who are spread out all over the globe. He found my Sevilla site on ‘The Offside’ and contacted me about doing an interview about the blog and what it’s like being a Sevillista in America. The date is still TBD, but it should be around the 11th of January. I’m excited about this opportunity and can’t believe I’ll be interviewed by the club I religiously support. When I figure out the date and time I’ll let everyone know. One-liner guide to La Liga–Jornada 4 ¡Qué guay! In my constant quest to indocrinate the Western World in the joy that is the Spanish culture, I present to you sangria. Now, you can make sangria in lots of different ways, but I give you my recipe, which I find to be the best. It’s adapted from a few Spanish recipes, but I find it to be the best tasting, sometimes a bit strong. Menudo Partidazo of the week! Both had 3-0 games in the Champions League but on other sides of the win loss column, does Sevilla have what it takes to win La Liga this season?